This article explains how to find a tax return file created in TurboTax CD/Download software for Mac. TurboTax support agents are unable to retrieve tax returns that were prepared in TurboTax CD/download software because your data is stored locally, on your computer's hard drive. E-filing does not create archive copies on our servers. Follow these steps to find your .tax file on your Mac OS 10.4.x (or later) computer. In the upper-right corner of your screen, click the Spotlight (magnifying glass) icon, and then type .tax in search field. Search results appear as you type. Tax return files will appear in the Documents section. The default name for tax files is the primary taxpayer's name followed by the 2-digit tax year. 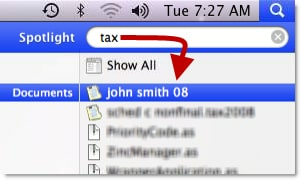 If you don't see your tax return, click Show All in Finder at the top of the Spotlight search list. You may also use the Finder (at the bootom of the screen on the app bar). Select All my Files on the left. Important: To open your tax file in TurboTax, you'll need the the version of TurboTax for the same year as the tax file. For example, you'll need to open your 2017 tax return in TurboTax 2017. Lost your software? How do I move my tax data file to another computer? How do I get a copy of a tax return prepared with the TurboTax CD/Download software?